Cash and others items were located during a stop last week. MIDDELPORT —A Gallipolis man is facing charges after drugs were allegedly found in a vehicle. Meigs County Sheriff Keith Wood reported, in a news release, that on Nov. 14, Deputy Tylun Campbell and K9 Cheri was sitting stationary at a stop sign on Township Road 361 at Leading Creek Road when Deputy Campbell observed a vehicle driven by Michael Clay. Deputy Campbell had previous knowledge that Clay’s driving privileges had been suspended. Deputy Campbell used K9 Cheri and conducted a sniff on the vehicle and K9 Cheri alerted on the driver’s door. A search of the vehicle was conducted and a piece of folded-up paper with a powdery substance was reportedly located inside. Clay was placed under arrest and after being advised of his rights, Clay reportedly admitted that that the powdery substance was heroin and it was his. Also allegedly located during the search was a black bag containing a syringe, a scale with residue, a plastic bag containing multiple plastic baggies, and a plastic bag with a white crystal-like substance on the driver’s side of the vehicle hidden under the middle console near the dash. Clay was asked what that substance was in the bag and he reportedly stated that it was “Meth”. A black iPhone and $240 were also found. Deputy Myers transported Clay to the Meigs County Sheriff’s Office. All items were seized, bagged and transported to the Meigs County Sheriff’s Office. The black Honda was inventoried and towed. Clay was also cited for driving under suspension and fictitious license plate. A forfeiture was served to Clay for the $240 cash and the black iPhone was returned to Clay upon being released. 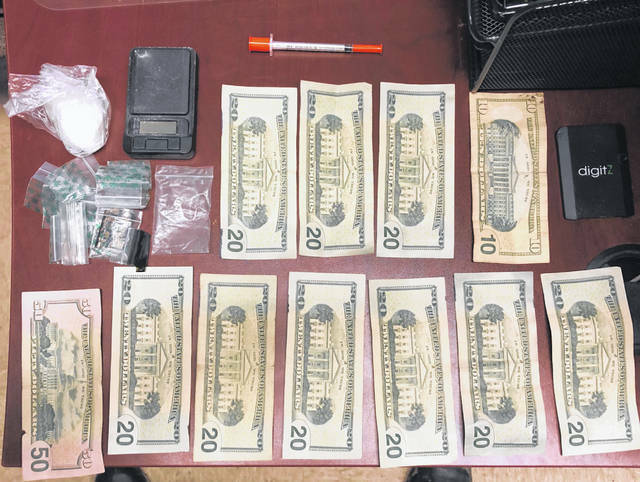 https://www.mydailysentinel.com/wp-content/uploads/sites/14/2018/11/web1_11.20-Clay-Traffic-Stop-seizure_ne201811191525529.jpgCash and others items were located during a stop last week.